A San Diego condo owner says his insurance rate increased by a whopping 45 percent, and he says his insurance company blamed Camp Fire — which occurred 600 miles away. SAN DIEGO (KGTV) - A San Diego condo owner says his insurance rate increased by a whopping 45 percent. He says his insurance agent blamed it on the deadly Camp Fire, 600 miles away. “I was just kind of dumbfounded,” says condo owner Neal Dunn. That was his reaction when he says his mail arrived with a massively increased annual premium total of more than $580 to insure his one bedroom condo. It’s located in University Heights, just down the street from a billboard for his insurer, Wawanesa. The billboard reads, “Low rates. It's kind of our thing." Dunn called his Wawanesa insurance agent. “He told me it was a direct result of the Camp Fire and that nothing could be done about it, rates were going up across the board,” he tells 10News. “There’s no way that a 45 percent increase could be tied to an event that happened just two months ago,” says Amy Bach with United Policyholders. It’s a nonprofit that advocates for consumers who need insurance. “They [couldn't] have raised their rates for their customers across the board that much,” she adds. Bach says major rate increases have to be state-approved and gradually implemented over time. So, water has been reportedly been the problem. Not fires. Regardless, fires are still a looming threat for many other Californians who do live in high-risk areas, in a state that has been ravaged by a series of deadly, destructive blazes. Bach says insurers are allowed to tell homeowners that they must join a more expensive, high-risk policy. 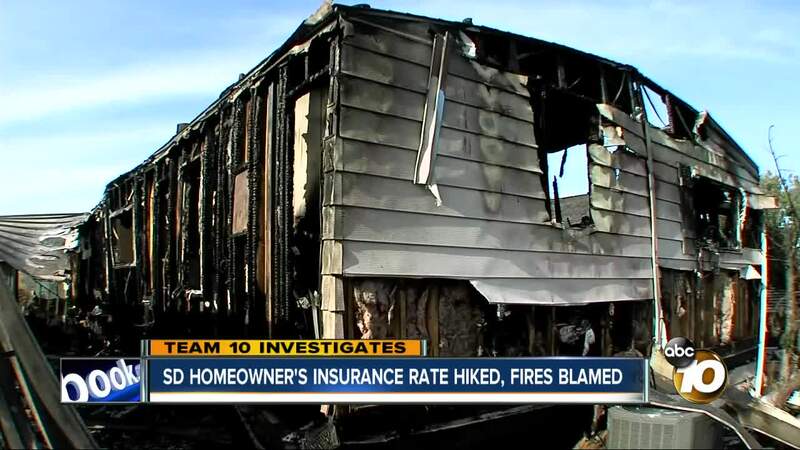 “If you're a homeowner in California and you live in a rural area where there's been wildfires or you are considered to be in a brush zone, you definitely should be prepared to be paying more for your home insurance going forward. Somewhat more. Not double,” she explains. She says private insurers can also drop customers all together, with some stipulations. If that happens, Bach says there’s a last-resort option called the California FAIR Plan. It’s bare bones state-sponsored coverage for homeowners and renters who have trouble getting insured elsewhere. For additional resources, visit https://www.uphelp.org/. Editor's Note: Wawanesa sent an additional statement after this story aired. See below. "We are committed to conducting our business with integrity and abide by the rules and regulations surrounding rate changes. In this case, the rate increase was filed with and approved by the California Department of Insurance before we implemented the changes on April 1, 2018."